We have very limited amounts of volunteer work available at Memorial Hall Library. We are very lucky to be supported by the Town of Andover with a large staff. Therefore a lot of the tasks that volunteers do at other libraries are done by staff members as part of their jobs. Many of these jobs, like reading to children, require special training that our librarians have worked very hard to learn and practice! MHL cannot support individuals who need to log a lot of volunteer hours over a short amount of time. Contact: Kate at 978-623-8444 / kbelczyk@mhl.org. Friends of Memorial Hall Library is a community-based membership organization dedicated to supporting and promoting Memorial Hall Library through programs, advocacy and financial support. Joining or donating to the Friends is an excellent way to support the Library. Work as a Library Page! Our page program is open to high school students 16 and older. Pages work 9 - 10 hours/week shelving and helping with other library tasks. Students may also receive a scholarship if they complete the required amount of work hours. Apply via the Town of Andover's employment website. If you would like to volunteer for more hours than what MHL needs, or want a variety of volunteer experience, here are some other great organizations in and around Andover that could use your time! Andona is a registered nonprofit founded in 1952 by a group of women who wanted to give back to the greater Andover community. Today, the primary objective of this charitable organization is to aid the youth and schools of Andover by raising funds through various functions, activities, and grants. Better known by some as the women who run Clown Town each May. Andona members have been running this old-fashioned carnival fundraiser the third weekend in May since 1956! Andona also plans its annual Shine the Light on Andover luminary kit fundraiser each Winter Solstice. Andona is about women working together towards a com­mon goal, all while forming long-lasting friendships along the way. Andona seeks adult volunteers to provide support with fundraising activities, planning membership socials, website design, handling finances, coordinating publicity, and joining committees responsible for its scholarship selection process and all aspects of its annual fundraisers. 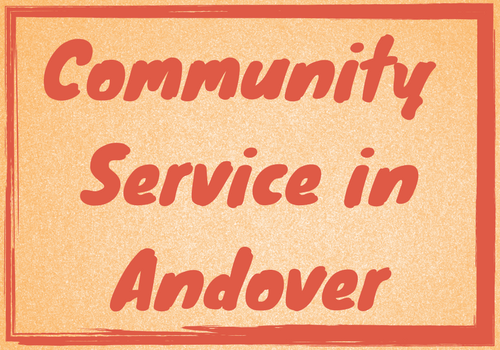 Members may also work directly with Andover Public School adjustment counselors to coordinate Andona's summer campership program for children of families in need. Students in grades 6 and up may also volunteer to work at Clown Town by emailing andona.student.volunteers@gmail.com. Opportunities include field set up and working at Andona's face painting, sand art, kiddie games, and food booths. During its school year fiscal cycle, Andona typically raises approximately $50,000. These funds are then given directly to Andover Public Schools, youth organizations, and individuals through the fund request and scholarship process, as well as via Andona's summer campership program for children of families in need. Andona provides significant & much needed funds in support of Andover Public Schools and youth programs. Those interested in joining can learn more by visiting www.Andona.org. Cleaning Pomps Pond and Rec. Park: If you like to be outdoors in the early morning, if you’re focused and you like to make a positive environmental impact, then you might want to consider cleaning up Pomps Pond and the Rec Park before the kiddos show up for camp. Preschool Park Events (the park off of Bartlett St.). You know the events: Luau Day, Teddy Bear Picnic, Fire Truck Day, etc. Be on hand to help out in the kid’s booths (fun stuff like face painting). Help out at a variety of fun events at the senior center, all summer long! The Andover SCRPT Program allows homeowners aged 60+ to earn a $675 tax abatement after completing 93 volunteer hours. Through the SCRPT Program, volunteers assist in the Senior Center, most town departments and in all of the schools. This program runs from July to June each year. Applications are available during the month on June only. Pick up trash with friends! Make your own schedule! Just show up at any of the AVIS reservations (check out the website below) with your own trash bag and rubber gloves and do your part to keep our lovely green spaces clean! Since this is very independent, be sure snap a few pics as proof of your hard work! AVIS is also seeking skilled volunteers to lead nature hikes, help with the AVIS table at various community events, provide pictures or articles for the AVIS newsletter, and help with regular mailings. Contact: online volunteer signup form. Volunteer at various YMCA programs in Andover and Lawrence, helping with classes and the food pantry. Gleaning is the act of harvesting the leftover crops from farms, and then distributing the surplus to food pantries, meal programs and low-income markets. Volunteers under 18 must register as individual gleaners, and need to arrange their own transportation (and it's recommended there are accompanied by an adult). Bread and Roses is a soup kitchen that provides a free evening meal to those in need. Volunteers are needed to help with meal prep and to help serve the evening meal. Contact: Lauren, 978- 681-8768 / breadandroses2@gmail.com / online volunteer signup form. Volunteer at ReStore - ReStore is their retail home improvement store located on Andover Street in Lawrence. Individual or Group Volunteer at a Build Site – if you are 16 years or older and accompanied by an adult over the age of 21, join Habitat on a build site and learn new skills! Contact: Jennifer Hilton, 978-681-8858 / volunteer@merrimackvalleyhabitat.org / online volunteer signup form. The MSPCA relies on a large group of active, committed volunteers who help in the adoption center, in our equine and farm center and out in the community. This dedicated group of men and women help care for the animals, assist with special events, and work with local businesses and corporations – they are there wherever extra help is needed. Contact: nevinsvolunteer@mspca.org / online volunteer application. Commonwealth Corps – A statewide initiative designed to engage Massachusettsresidents of all ages and backgrounds in service to their community. Corps members serve up to twelve months in full-time, part-time or flex-time capacities and receive a stipend. Connect and Serve - A statewide web portal that connects residents with local volunteer opportunities. Search for volunteer opportunities by area or interest. Massachusetts Service Alliance – A private non-profit organization that serves as the state commission on community service through the following volunteer projects. United Way – A volunteer matching service provided by the United Way. VolunteerMatch - Contains volunteer opportunities by cause or volunteer age in the local area. Use the advanced search option to limit the results to within so many miles of Andover. Last updated 3/29/2019, please submit any corrections or added opportunities to ya@mhl.org.